I don’t have a custom vinyl cutting machine to cut the letters for my sign. I want to use something more eco-friendly and less shiny than vinyl too. I settled on printing the words in black ink on white paper from my computer. If you use decoupage medium, including Mod Podge, on a print from an ink jet printer, the ink will smear. I don’t have a smearing issue when I use a print from a laser printer. Unfortunately, the ink is running low in my laser printer. It isn’t printing as solid and dark as I need for this project. I carefully cut the printed words from an ink jet print. I painted the letters with black craft paint and allowed them to dry. The craft paint covering the printing ink will not smear when you brush Mod Podge over it. You can see how my printer didn’t print the stand alone “p” in the photo above solid black. I painted the “Hap” with one coat of black craft paint. 1. Cut the letters from your computer printout. I keep a spare pair of nail scissors in my craft room to use for detailed paper cuts. It makes the job is little easier. 2. Paint the letters with black craft paint and allow them to dry. 3. Paint the background of the sign with white craft paint. I used three coats of paint. 4. Tape off the white edges of the sign with painter’s tape. 5. Paint over the edge of the painter’s tape with the white background paint. This way, if any of the first coat of paint accidentally seeps under your painter’s tape it is the same color as the background and will not show. A single coat of paint is all you need to seal the edge lines. 6. Paint the edges of the sign with black painter’s tape. I also painted the back of the sign black because it will show when I place it on the head table at the party. I used two coats of black paint. 7. Remove the painter’s tape from the sign while the paint is still wet to keep your edge lines crisp. Ta Da! Perfect paint lines! 8. Use the Mod Podge and paint brush to glue the paper letters to the sign and allow it to dry. The craft paint keeps the ink jet printer ink from smearing. 9. Seal the paper letters with a top coat of Mod Podge. I used Mod Podge Gloss. I sealed the front and back of the sign to make the surface consistently glossy. 10. 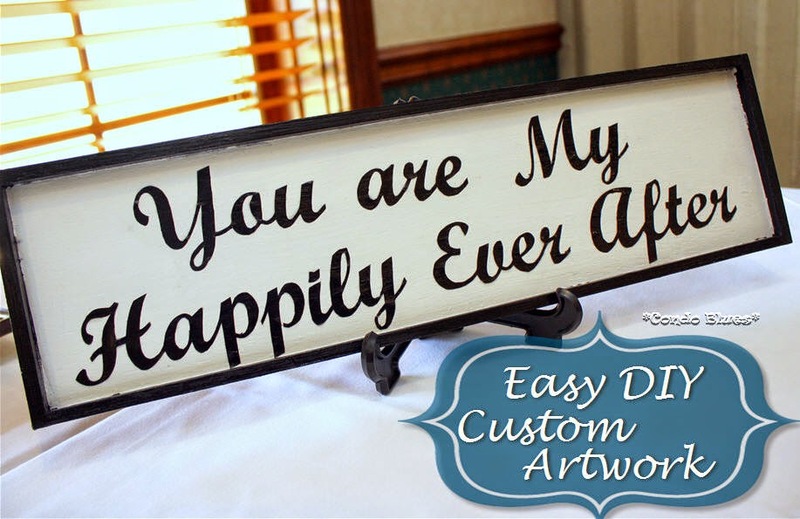 Prop your sign on a easel or hang it on a wall and celebrate your love! Happy 50th Wedding Anniversary Mom and Dad!